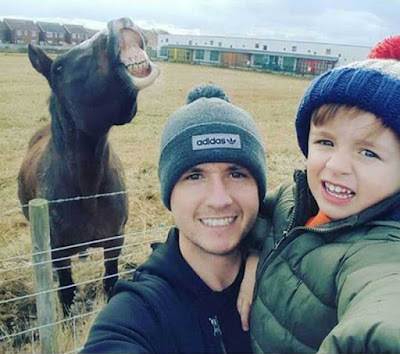 A man has been branded ‘shameful and stupid’ after a picture taken by his toddler son of a grinning horse in the background of their selfie has won them a £2,000 holiday – because he didn’t have the horse owner’s consent. David Bellis, 31, says his three-year-old son Jacob had taken the photo of the duo enjoying a walk together when a horse in the background looked up and ‘smiled’. The father-of-one and partner Rhian Jones, 31, entered the picture into Thomson Holiday’s ‘Made Me Smile’ competition and scooped a £2,000 trip – which would be their first family getaway. 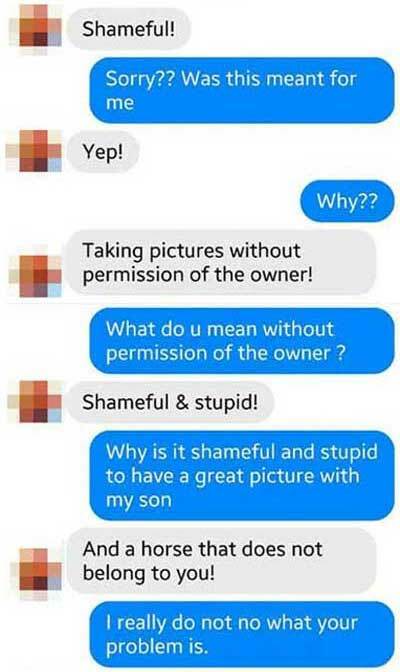 However David was then been told by the horse’s owner Nicola Mitchell that he did not have her consent to photograph the horse – and she contacted Thomson Holidays to complain. David, later received messages from Nicola’s friends calling his actions ‘shameful’ and demanding he hand over half the winnings. Mother-of-three Nicola, also from Prestatyn, bought the horse Betty for her daughter Katelyne three years ago and Betty has since been taught to stick out her tongue. She said: “I was really annoyed to hear he had won a £2,000 holiday and had used a picture of our horse without our permission. He should have asked for our consent. It’s not like it’s just £100. £2,000 is a lot of money and would go quite a long way for a family. I didn’t give him permission to use our horse in a competition. I will be phoning Thomson Holidays to tell them what has gone on but I don’t know what they will do. But I will tell them I’m not happy. There should be some token of gesture as it is our horse that has really won them the holiday. I didn’t even know that this competition was on. If I had known about it we would have entered it ourselves and could have won as Betty is always sticking out her tongue.” David added: “The field is right behind our house, in fact you can see our home in the picture. “Jacob loves the horses and wanted to show mummy a picture of us enjoying the day so we posed up with a horse quietly eating grass in the background. I couldn’t believe it when I realised the horse had decided to pose up for the photos too. He started out as a smirk and then started grinning wildly, he looked absolutely crazy. He clearly loved being in front of the camera and enjoyed the attention. When I saw Thomson Holidays were running a competition with smiling as the theme I thought of this picture that I had taken back in November and thought it was worth entering. I never thought I would win so we were all over the moon when I did. Jacob was particularly happy as he sees the picture as his. I never thought of asking anyone for consent for the horse – it was clearly viewable from the road, so why would I? I just don’t understand it at all.” However Nicola Mitchell’s dad Phillip Dunn, 67, said: “He has wormed his way into a £2,000 voucher. He is earning money off our horse, which is naughty. My daughter could have entered the competition if she had known about it.” Thomson Holidays have now confirmed that Mr Bellis and his family will still receive their prize despite the row. Wow! Nicola and her family seem like a small and nasty bunch. Bitterness like that is toxic. Oh, xoxoxoBruce, I always enjoy your responses. You make me laugh. Ty.